I met Gary Parker almost 30 years ago when I was trying to get into the Renaissance Festival academy. The short version of the story is my family had gone on a one-month trip to Europe and I missed the first two weeks of academy in what would be my rookie year. I’d mentioned it would happen at my audition but by the time I got home, I’d been cut. A normal person would have just tried out the next year. Not me. All my friends had gotten into the festival that year. I didn’t want to wait. So I followed Gary Parker, who was director of the academy at the time, around for most of the evening trying to convince him to give me a chance. It worked. I think because he just got tired of telling me no. If I’d not gotten into the festival that year, I wonder if I would have simply chosen to forego trying out the next year. I think it’s very likely I would never have gone back. So Gary changed the entire course of my life that night. That would be enough to call Gary a friend. Since that time, though, he has been one of the most constant sources of encouragement and inspiration for me. I’ve asked him to give advice on a few things I’ve written over the years. At least once, he told me to trash the entire thing. Only the best of people tell you something you’ve written is awful. He was right, by the way. I would imagine most people who go to the festival have seen Gary but don’t even realize it. 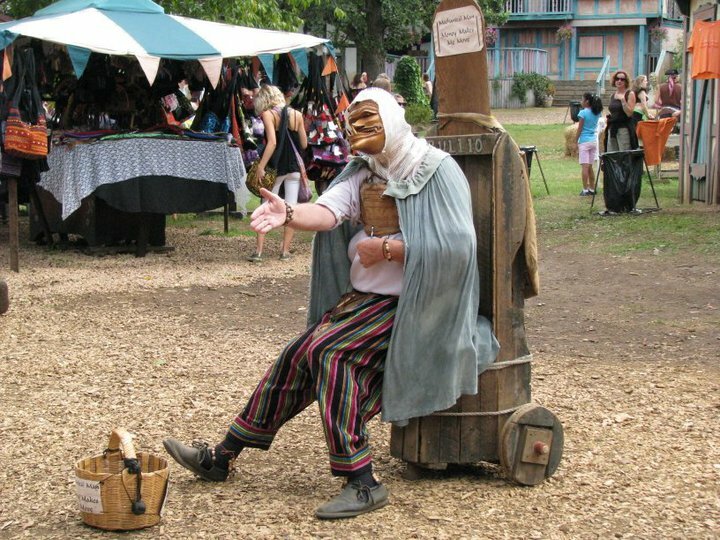 He works primarily with a mask, sitting on a chair and turning a crank any time someone drops money in his bowl. Mostly nickels and quarters. The Dregs sing songs for five bucks. Gary makes kids laugh for nickels and quarters. For years, he was the leader of the festival academy where he taught a generation of performers how entertain an audience. On the first day, he would get up and lead a bunch of brand new people thought a series of wordless improvisational structures. They were the same every year. He would end with a story about doing one of them at the 1980 Winter Olympics. It was the same story every year. And it never got old. We usually only see each other at the festival these days but the first time I see him, he always tells me how his kids and grandkids are doing. Because he cares and because he knows I’m interested. Every morning, he stands right by the entrance gates to greet the audience. He’s always been one of the first people to greet the audience. If you’d never stayed late after an academy session, you probably didn’t know how good a piano player he is or that he writes some very catchy music. When the festival initiated the Lee Walker award, I told anyone in a position to make a decision that Gary needed to get it first. To me, there was no name that could ever be first on the list but his. I’m really glad other people agreed. It truly amazes me that I can count Gary as a friend. I wouldn’t be who I am today without him. Gary isn’t online too much so I don’t know when he’ll see this. But you know, it isn’t so important that Gary knows how awesome he is. It’s important that everyone else does. Gary’s a wonderful guy. He changed the arc of my life too, in some very similar ways. Both during the five years I returned to hang out at the Festival Academy every year—I ended up being the do the opening up and closing the theater stuff for him for at least one of those—and when I took his more in-depth college improv course. thanks so much for this. Mr Parker was my drama coach and teacher at North High School in 1965-66. What a wonderful prtrait you paint here.